No Starch Press, publisher of a wide range of LEGO related books, has teamed up with Humble Bundle (again!) to provide the new Humble "Scholl's Out" Bundle - a selection of ebooks designed to keep kids (and adults) busy and interested during the holidays. 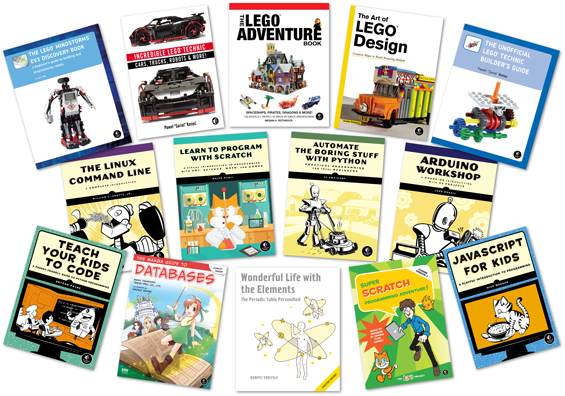 In adddition to books on Arduino, Scratch and Linux, the promo includes The Art of LEGO Design, The LEGO Adventure Book, Vol. 2, The Unofficial LEGO Technic Builder's Guide, and the LEGO MINDSTORMS EV3 Discovery Book. The Humble Bundle initiative is attractive on several fronts. It is a cheap way to get a number of interesting (LEGO related!!) books. Also, a part of the money generated through the sale of these ebooks goes to charities. The previous Humble Bundle presented by No Starch Press last February, raised over $100,000 for the Electronic Frontier Foundation and the Freedom of the Press and this time these same organisations will again benefit from the initiative. If you want to get thes ebooks cheap, get them as soon as possible, but if you want to help make a difference, you can choose how much (more) you want to pay for them to benefit these non-profit organisations.